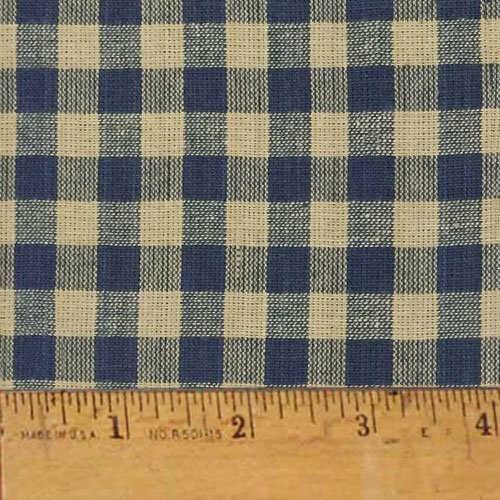 From A. E. Nathan this homespun yarn-dyed fabric features a plaid design and is perfect for quilting shirting table linens and more. Colors include black and natural. Heritage Blue 5 - This soft 100% cotton yarn dyed homespun fabric is 44 inches wide and is the perfect fabric to use for the popular ragged style quilting. The colors of this fabric are soft dark blue a dark off white neutral. It coordinates well with all our other JCS Americana and Primitive fabrics and kits. Sold by the yard. Multiple yards will be shipped in one continuous length up to 15 yards. Over 15 yards will be multiple pieces. 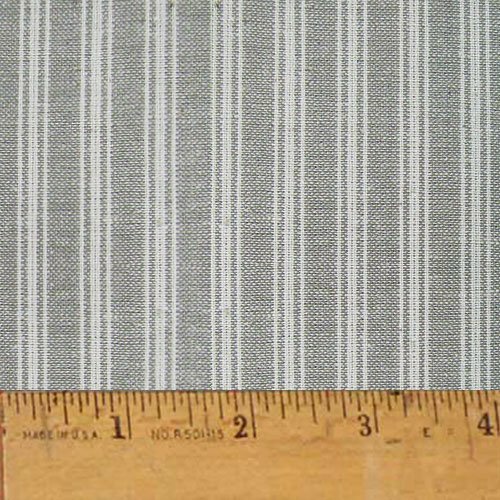 Magnolia Gray Ticking Stripe - This soft 100% cotton yarn dyed homespun fabric is 44 to 45 inches wide and is the perfect fabric to use for the popular ragged style quilting. The colors in this fabric are a rich shade of gray and a complimentary soft white. Use our Magnolia Grays in your rustic, primitive, or farmhouse decor. Sold by the yard. Multiple yards will be shipped in one continuous length up to 15 yards. Over 15 yards will be multiple pieces. Mountain Lodge 3 - This soft 100% cotton yarn dyed homespun fabric is 44-45 inches wide and is the perfect fabric to use for the popular ragged style quilting. 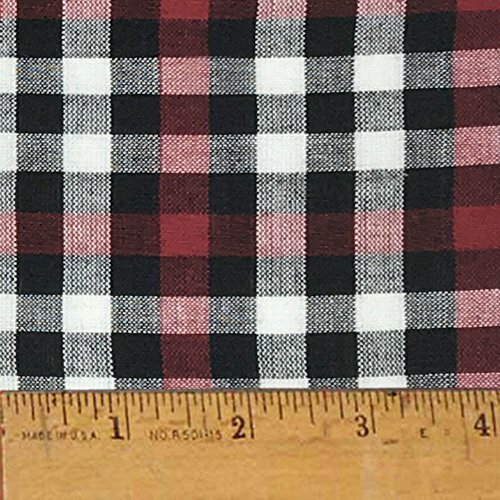 The colors of this fabric are white, red and black. 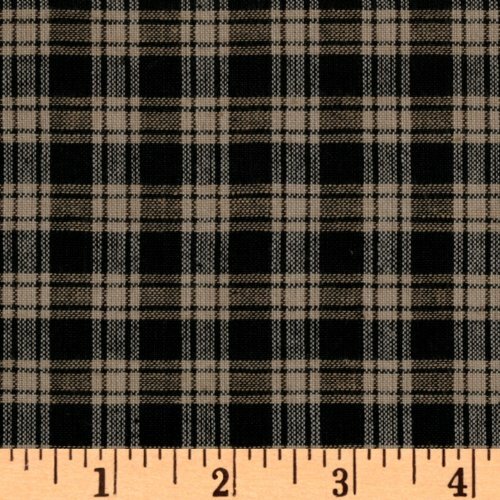 It coordinates well with many other buffalo check and Mountain Lodge plaid fabrics. Sold by the yard. Multiple yards will be shipped in one continuous length up to 15 yards. Over 15 yards will be multiple pieces. This fabric is flammable and is not suitable for children's sleepwear. 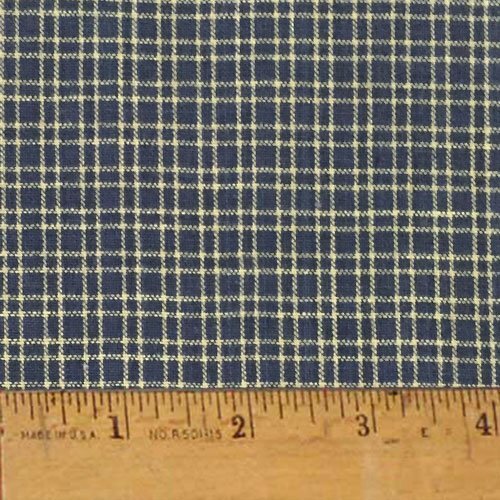 Heritage Blue 1 - This soft 100% cotton yarn dyed homespun fabric is 44 inches wide and is the perfect fabric to use for the popular ragged style quilting. The colors of this fabric are soft dark blue a dark off white neutral. It coordinates well with all our other JCS Americana and Primitive fabrics and kits. Sold by the yard. Multiple yards will be shipped in one continuous length up to 15 yards. Over 15 yards will be multiple pieces. Mountain Lodge 1 - This soft 100% cotton yarn dyed homespun fabric is 44-45 inches wide and is the perfect fabric to use for the popular ragged style quilting. The colors of this fabric are a deep rich red and black. 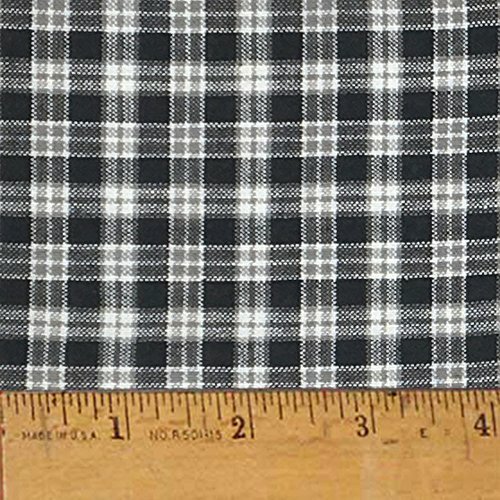 It coordinates well with many other buffalo check and Mountain Lodge plaid fabrics. Sold by the yard. Multiple yards will be shipped in one continuous length up to 15 yards. Over 15 yards will be multiple pieces. This fabric is flammable and is not suitable for children's sleepwear. Mountain Lodge 2 - This soft 100% cotton yarn dyed homespun fabric is 44-45 inches wide and is the perfect fabric to use for the popular ragged style quilting. The colors of this fabric are white and black. 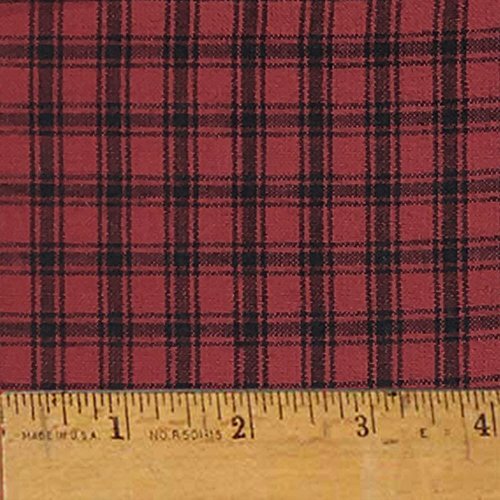 It coordinates well with many other buffalo check and Mountain Lodge plaid fabrics. Sold by the yard. Multiple yards will be shipped in one continuous length up to 15 yards. Over 15 yards will be multiple pieces. This fabric is flammable and is not suitable for children's sleepwear. 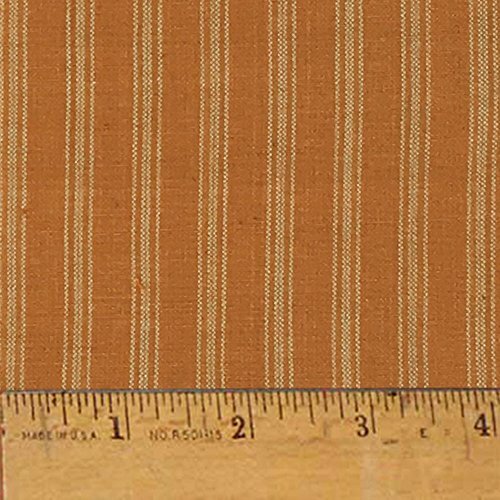 Pumpkin Spice Ticking Stripe - This soft 100% cotton yarn dyed homespun fabric is 44 to 45 inches wide and is the perfect fabric to use for the popular ragged style quilting. The fabric features a rich pumpkin or rust color and a soft tea dye neutral which are widely used colors in autumn style crafts and in contemporary home decor projects. Pumpkin Spice 1 matches up with our other JCS fabrics in the Pumpkin Spice line although there may be slight color differences in the bolt dye lots. Sold by the yard. Multiple yards will be shipped in one continuous length up to 15 yards. Over 15 yards will be multiple pieces. 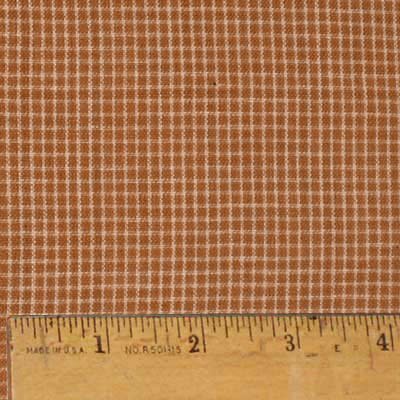 Pumpkin Spice 1 - This soft 100% cotton yarn dyed homespun fabric is 44 to 45 inches wide and is the perfect fabric to use for the popular ragged style quilting. The fabric features a rich pumpkin or rust color and a soft tea dye neutral which are widely used colors in autumn style crafts and in contemporary home decor projects. Pumpkin Spice 1 matches up with our other JCS fabrics in the Pumpkin Spice line although there may be slight color differences in the bolt dye lots. Sold by the yard. Multiple yards will be shipped in one continuous length up to 15 yards. Over 15 yards will be multiple pieces. Looking for more Homespun Cotton Fabric similar ideas? Try to explore these searches: Hid Access Control, English Pewter Finish, and Faceplate Slate. Look at latest related video about Homespun Cotton Fabric. Shopwizion.com is the smartest way for online shopping: compare prices of leading online shops for best deals around the web. Don't miss TOP Homespun Cotton Fabric deals, updated daily.